Technical Car Experts Answers everything you need: Random misfire code gets set on car when engine gets warm or in hot conditions? Random misfire code gets set on car when engine gets warm or in hot conditions? A random misfire code can be set on newer vehicles with OBD II onboard diagnostics when multiple misfires occur randomly in multiple cylinders. The cause is typically a vacuum leak in the intake manifold, throttle body or vacuum plumbing, a defective Exhaust Gas Recirculation (EGR) valve that is leaking exhaust into the intake manifold, or even bad gasoline. Start by checking engine intake vacuum. Connect a vacuum gauge to a vacuum port on the intake manifold. Start the engine and note the vacuum reading. On most engines, intake vacuum should be steady between 16 and 22 inches. A lower reading usually indicates a vacuum leak, but it might also indicate an exhaust backpressure problem (such as a plugged catalytic converter) , worn valve guides or weak valve springs. A vacuum reading that gradually drops while the engine is idling almost always points to an exhaust restriction. An oscillating vacuum reading usually indicates a leaky valve or worn valve guides. Too fast an idle speed. The powertrain control module (PCM) will maintain normal idle speed and compensate for a small vacuum leak by closing down the throttle body air bypass. But if the leak is too large and the idle control system cannot compensate for the extra air, the engine may idle too fast. Common leak paths include the throttle body gaskets, intake manifold gasket, any of the engine vacuum fittings, hoses or vacuum-operated accessories (such as the power brake booster or EVAP canister purge valve). It is even possible that leaky O-rings around the fuel injectors may be allowing air to leak past the seals. Another overlooked item can be a worn throttle shaft. A rough idle or stalling. A large vacuum leak can lean the air/fuel mixture out to such an extent that an engine will not idle at all. An EGR valve that is stuck open at idle can have the same effect as a vacuum leak. So too can a loose positive crankcase ventilation (PCV) hose, a leaky PCV valve or the wrong PCV valve (one that flows too much air for the application). If somebody replaced the PCV valve recently, they may have installed the wrong PCV valve. The rough idle in all of these cases is caused by "lean misfire." The fuel mixture is too lean to ignite reliably so it often misfires and fails to ignite at all. Lean misfire will show up as elevated hydrocarbon (HC) readings in the exhaust, which may be enough to cause a vehicle to fail an emissions test. Hesitation or misfiring when accelerating. This may be due to a vacuum leak, but it can also be caused by dirty fuel injectors, a weak fuel pump (low fuel pressure) or a faulty fuel pressure regulator It can also be caused my ignition misfire due to worn or fouled spark plugs, bad spark plug wires, or weak ignition coil. The important thing to keep in mind about vacuum leaks is that they have the most noticeable effect at idle. At part and full throttle, more air is entering the engine through the throttle opening so a vacuum leak has less effect on the air/fuel ratio. Start by visually inspecting all the vacuum hoses and connections. Look for disconnected, loose or cracked hoses, broken fittings or other obvious problems. Also, listen to the engine while it is idling (outdoors only or with proper exhaust ventilation, NEVER indoors!) Vacuum leaks will often make a sucking or whistling noise. A faster technique for finding vacuum leaks is to get a bottle of propane and attach a length of rubber hose to the gas valve. Open the valve so you have a steady flow of gas. Then hold the hose near suspected leak points while the engine is idling. If there is a leak, propane will be siphoned in through the leak. The resulting "correction" in the engine air/fuel ratio should cause a noticeable change in idle speed and/or smoothness (Note: you may have to temporarily disconnect the idle speed control motor while doing this test). Use caution because propane is highly flammable and can be ignited by a spark or flame. A "smoke machine" can also be used to find small leaks. A smoke machine feeds artificial smoke into the intake manifold (engine OFF). The smoke may also contain ultraviolet dye to make it more visible when illuminated with UV light. If you see smoke coming out of a hose, fitting, connection, manifold gasket or a crack in the manifold, you have found the leak. Note: Plastic intake manifolds can crack, often in places that are difficult to see. The most vulnerable places are plastic vacuum ports on the manifold. A less effective method for finding a vacuum leak is to lightly pressurize the intake manifold with about three (3) lbs. of regulated air. Use an adjustable regulator on the air supply and feed air into the intake manifold through a vacuum port. DO NOT use any more pressure than this! Plastic intake manifolds can be easily damaged by excessive pressure. With the engine off and the intake manifold pressurized, spray soapy water on suspected leaks. If you see bubbles, you have found the leak. Propane can also be used in conjunction with an infrared exhaust analyzer. Vacuum leaks almost always cause carbon monoxide (CO) readings to drop, and fluctuating hydrocarbon (HC) readings in the exhaust. The exhaust analyzer can (1) tell you if there is indeed a leak, and (2) where the leak is using the propane procedure described above. The trick here is to look for a rise in CO and a drop in the HC readings while directing propane at suspected leak points on the engine. Two types of vacuum leaks can be diagnosed with an exhaust analyzer. The first kind is a general vacuum leak (PCV hose, brake booster, etc.) that leans out the mixture and causes a very low CO reading and only a slightly higher fluctuating HC reading. The O2 reading will also be high. The second kind of vacuum leak is a "point" leak that affects only one or two cylinders (a leaky manifold gasket or a crack or porosity leak in one of the manifold runners). This will be indicated by a normal or low CO reading combined with high fluctuating HC readings. O2 will again be high. It is important to note that an overly lean idle mixture will also cause a fluctuating HC reading the same as a vacuum leak. To tell one from the other, there is a simple "trick" you can use. Momentarily enrich the idle mixture to 1.5 to 2.0% CO by directing propane into the throttle body. If the engine smooths out and HC drops and remains stable, the problem is a lean idle condition. Check for dirty injectors, low fuel pressure or a defective fuel pressure regulator. If HC still fluctuates, however, the engine is still too lean in one or more cylinders indicating a vacuum leak. If you suspect a vacuum leak in a particular vacuum circuit, use a hand vacuum pump to isolate the fault by applying vacuum to the hoses and connections until you find the one that does not hold vacuum. On some vehicles, there may be a vacuum reservoir, a small metal canister that holds vacuum. These can sometimes leak. The EGR valve should remain CLOSED when the engine is COLD and IDLING. When the engine is warm and is accelerating or working hard under a load, the EGR valve should OPEN. With vacuum-operated EGR valves, intake vacuum pulls the valve open when conditions are right. Some EGR valves also sense exhaust backpressure and do not open until backpressure reaches a certain level. On others, the EGR valve is electronic and is controlled by the PCM. No vacuum is used to operate the valve. When the EGR valve opens, it allows a small amount of exhaust gas to be siphoned back into the intake manifold. This dilutes the air/fuel mixture, cools combustion and reduces the formation of oxides of nitrogen (NOx). If the EGR valve fails to close when EGR is not required, or if it leaks because of carbon buildup on the valve stem or valve seat, exhaust will be sucked into the intake manifold all the time creating a lean fuel mixture. This will cause lean misfire and set a random misfire code. Cleaning the EGR valve seat and stem may eliminate the sticking problem. If this fails, replace the EGR valve. On some engines, this kind of problem may not appear until the engine warms up. The EGR valve may remain closed while the engine is cold, but it starts to leak when the engine is warm. This may be due to a weak spring inside the EGR valve. The fix here is to replace the EGR valve. The operation of the EGR valve can be checked several ways. One is to observe the valve stem (if possible) while goosing the throttle. No movement would indicate a problem with the EGR valve or its vacuum supply. Another is to apply vacuum directly to the EGR valve with a hand pump with the engine running at fast idle. This should pull open the EGR valve and cause a momentary drop in rpm. A third method is to replace the EGR valve and see if that cures the random misfire problem. Remove the spark plugs and use a compression tester to check compression. A cranking compression test is done with the ignition disabled and the throttle held open. On most engines, cranking compression should be 140 to 160 pounds per square inch (PSI) or higher in every cylinder. If low, the cylinder may have a burned exhaust valve or leaky head gasket, or weak or broken valve spring. A "wet" compression test can then be performed to determine if the problem is the rings, or the valves or head gasket. Squirt a few drops of oil into the cylinder through the spark plug hole to temporarily seal the rings. Repeat the cranking compression test. If the readings are now higher, the problem is worn rings. If there is no change in the readings, the engine has a valve problem or a leaking head gasket. Possible causes of low compression include leaking head gasket, burned exhaust valve, bent intake or exhaust valve, weak or broken valve spring, or worn camshaft lobes. Remove and inspect the spark plugs. If oil or carbon fouled, the engine is probably sucking oil past worn valve guides and seals. Replacing the spark plug will only temporarily solve the misfire problem. If the spark plug is normal, check the plug wire and boot for damage or looseness. Measure resistance end to end. Replace the wire if resistance exceeds specifications (about 50,000 ohms/foot). If the spark plug wire is loose, damaged, burned, chaffed or exceeds resistance specifications, replace it. On coil-on-plug (COP) ignition systems, there is no spark plug wire so inspect the coil sheath for cracks or carbon tracks. If ignition and compression are both okay, focus next on the injectors. Use a test light or voltmeter to see if the injector is receiving voltage when the key is on, and that the injector solenoid clicks when the injector circuit is grounded. If the injector is functioning electrically, it may be clogged with fuel varnish deposits. If cleaning cannot restore normal fuel delivery, the injector must be replaced. Misfire in two "paired" cylinders in an engine that has a distributorless ignition system (DIS) would usually tell you the DIS system has a bad coil. Random misfires can occur if the fuel injectors fail to delivery their normal dose of fuel to the engine. This creates a lean air/fuel mixture and increases the risk of lean misfire. The underlying cause may be dirty fuel injectors (a buildup of varnish deposits in the injector nozzles that may occur over time from using low detergent gasoline or frequent short trip stop-and-go driving), or low fuel pressure caused by a weak fuel pump, defective fuel pressure regulator or dirty fuel filter. One way to check for dirty injectors is to use a "pressure drop test." 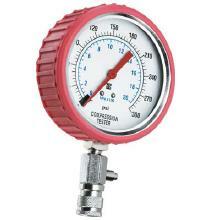 This requires a fuel pressure gauge, connecting the gauge to the fuel supply rail and comparing the drop in pressure when each injector is energized for a few seconds with the key on engine off. If an injector shows a significantly lower pressure drop than the others, it is restricted and should be cleaned or replaced. Don't overlook the possibility of "bad" gasoline. Gasoline contaminated with water or excessive amounts of alcohol will run lean and cause misfires. Labels: Random misfire code gets set on car when engine gets warm or in hot conditions.